Portfolio for JIRA lets you define arbitrary parent-child relationships between issues, and to show the parent link field in both Portfolio for JIRA and JIRA. 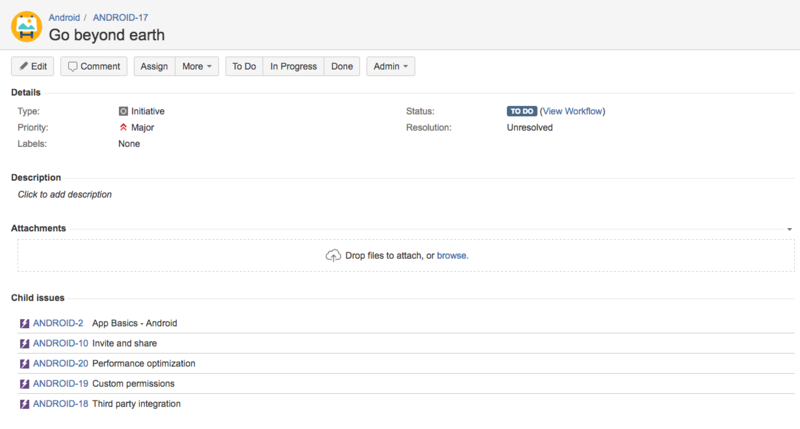 You can also choose to make the team field display in JIRA. When you assign a team to an issue in Portfolio for JIRA, the team is reflected in the JIRA issue as well. You can also change the assigned team in JIRA. Click Custom fields, and then find the 'Parent link' custom field. Select the screens you want to add the 'parent link' field to, and click Update. Now you can see and edit the 'parent link' field in your JIRA issues. You can also see the child issues of the parent. If the issue is at the top of the hierarchy, you can't set a parent issue. If the epic link is set, you can't set a parent link. If the issue is a sub-task, you can't set a parent link. Epics don't show up in the parent link – you must use the epic link instead. The parent that you set has to match the hierarchy configuration. For example, you can't set the parent of a story to be an initiative. JIRA can and will let you convert a story with an epic link into an initiative, if need be. However, a warning will be displayed for that issue in Portfolio for JIRA – indicating that the issue doesn't coincide with the hierarchy configuration in Portfolio for JIRA. Click Custom fields, and then find the 'Team' custom field. Select the screens you want to add the 'team' field to, and click Update. Now you can see and edit the 'team' field in your JIRA issues. Keep in mind that in order to see the field in the issue screen, you must assign a team to the issue in Portfolio for JIRA. Find out more about teams here. If you don't have a team assigned to the issue, the 'team' field won't show up. If you assign a plan-specific team to an issue, you will be able to see it in the issue. However, unless you make the team a shared team, you won't be able to assign a plan-specific team from the issue itself. You can use the JQL search to find the 'parent link' and 'team' custom fields in JIRA. Go to Issues (in header) > Search for issues. If you're searching for the child issues of a parent issue, type "Parent Link" = EX-000. If you're searching for the child issues of multiple parent links, type "Parent Link" in (EX-000, EX-001,EX-002, EX-003). If you're searching for issues assigned to a specific team, type Team ="shared team name". If you're searching for issues assigned to any set of teams, type Team in ("Shared team 1", "Shared team 2", "Shared team 3"). Depending on the JQL used, especially when using the OR operator, there may be more issues returned than what you need. We recommend you thoroughly check the results to make sure you have all the issues you're looking for.